Is a chemical war really the best choice when it is proving increasingly less effective and when non-chemical, heat treatments – like structural pasteurization co-invented by David Hedman in the patented ThermaPure Heat Process – are recommended by the Centers for Disease Control and Prevention (CDC) and are readily available to mitigate these concerns? Chemical pesticides – historically the first choice in killing bed bugs – are increasingly cited as the cause of illness to occupants/residents and pest control applicators. According to the Sept. 23, 2011 edition of the CDC and Prevention Morbidity and Mortality Weekly Report (volume 60, No. 37), acute bed bug pesticide-related illnesses have been reported in at least seven states with one fatality reported due to pesticide poisoning. But those made ill by pesticides in the CDC report are likely just a fraction of those that are ultimately affected by exposure to these chemicals. Many may overlook minor symptoms and often exposure to chemicals can be cumulative or have an extended latency period with symptoms exhibiting years, even decades later. Bed bug pesticides are toxic. While commonly used pyrethrins are only slightly acutely toxic, they are a sensitizer/irritant that is considered to cause cancer. Permethrin is moderately acutely toxic, possibly cancer-causing, and can cause endocrine disruption. Propoxur, which is not registered by the EPA for bed bug control but has been used illegally by some pest control companies, is highly toxic and probably cancer-causing, with reproductive effects, neurotoxicity, and kidney/liver damage. According to the CDC report, pesticide-related illnesses have been caused after chemical treatments conducted by both individual consumers and professional pest management companies. Children, in particular, are at risk. They face the highest pesticide exposure risk since they tend to sit, crawl or roll on the ground, near application sites where pesticide vapors and residues may settle. Because traditional chemicals are increasingly ineffective against pesticide-resistant bed bugs and their eggs, some pest control companies are even pressing to use more dangerous chemicals. For instance, New Jersey’s Department of Environmental Protection fined a Newark company $860,000 in 2011 for using hazardous pesticides to fight bed bugs. An investigation found that two chemicals unapproved for indoor use were used. Several states have already asked the EPA to weaken their health standards to allow pesticides previously banned for indoor use. The EPA rejected such a request from Ohio authorities, which would have allowed exterminators to use propoxur to kill bed bugs in clients’ homes. Due to concerns about nervous system damage in children, the EPA banned propoxur for home use. In place of increasingly dangerous chemical use, an effective CDC-recognized bed bug eradication method known as structural heat should be the first option. The CDC noted that heat treatments, like the type administered by industry pioneer ThermaPureHeat, “effectively control bed bugs” as part of an Integrated Pest Management (IPM) program. The ThermaPureHeat process, co-invented by Dave Hedman, involves heating single rooms or entire structures to at least the minimum 118 degree Fahrenheit (for a minimum of one hour) guideline cited by the CDC. 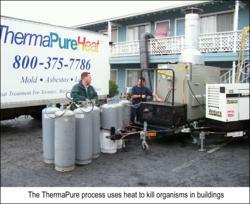 The ThermPureHeat Process uniquely filters while heating, which protects the technicians and guests from any airborne particulates or chemicals used in prior treatments that are stirred up during the process. Bed bugs often avoid heat by crawling into basements or crawlspace areas below the house. Therefore it is critical to heat the sub area of the home, which is often contaminated with dust, mold, and other pathogens. This mandates the use of filtration during the heat process for safety purposes. The heat penetrates deep into a structures cracks and crevices to kill bed bugs and their eggs where they are hiding. Pesticides, in contrast, are typically not effective on bed bug eggs, so multiple treatments are often required. With the CDC’s report and other research clearly showing that the chemicals used for pest control are damaging the health of people and our environment, it is time for the hospitality industry to adopt available non-chemical, heat-based technology.